More sensors means more data... which means more chips to be sold... which means more revenue. A decade ago, Intel’s primary data source for its PC and server microprocessors were the people who used Intel’s products. Today, those data sources are sensors connecting the Internet of Things, and Intel wants them everywhere. 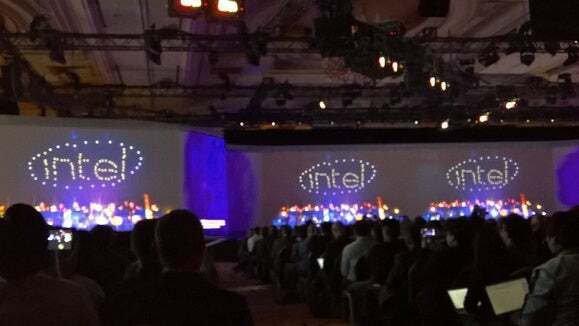 Intel’s CEO Brian Krzanich showcased a number of different initiatives during the company’s CES 2016 keynote on Tuesday, all with the goal of embedding sensors in as many places as possible—including clothing, sporting gear, and drones. To start, Intel will be embedding its tiny button-sized Curie processor into ESPN’s upcoming Winter X Games, quite literally. These Curie chips will be mounted onto snowboards that the pros will use during competition, specifically the Men’s Snowboard SlopeStyle and Men’s Snowboard Big Air events. According to Krzanich, this will provide the athletes with in-depth performance data, like their in-air rotations, jump height, and distance. To really show this off, Krzanich invited a pair of BMX bike riders to the stage, with sensors built into their bike wheels and handlebars. A different partnership with Red Bull Media House will bring Curie technology to other athletic gear, so even non-extreme sports pros can get in on the fun. To demonstrate this during the keynote, an athlete somersaulted onto stage, performing a bit of parkour mixed with gymnastics, while real-time sensors tracked his every move. For live sports fans, Intel has joined forces with Replay Technologies, and Krzanich proclaimed that the company’s freeD technology will “set a new standard for fans everywhere.” It turns video into full 360-degree 3D video—so that you can view a Kevin Durant dunk from literally any perspective. During last year’s CES, Intel announced a partnership with Luxottica’s Oakley brand with a focus on smart eyewear, and this year, we got to see the fruits of their labor: “Radar Pace,” a pair of smart sunglasses that the user controls with his or her voice. The system will primarily be a fitness and exercise coach, and will launch in late 2016. We also saw two new fitness-focused garments from fashion tech company Chromat: The “adrenaline dress,” which expands the garment when the wearer feels adrenaline, and a sports bra that vents air when the wearer exercises. Rounding out the fit tech portion of the keynote was New Balance president Rob Demartin, announcing that Intel and New Balance would work together on building a smartwatch optimized for runners. This partnership will allow New Balance to create smart sneakers and develop the ability to print out custom midsoles, a feature that will launch in April. Besides sports, we saw Intel’s sensor push in a number of other innovative ways—including drones equipped with LED lights that were synced in time with a symphony of music, and a first-person shooter using Intel’s Skylake processor. Krzanich also showed a demo he’s showed before, where he scans someone directly into a game using an HP Spectre X2 and a technology called Uraniom. 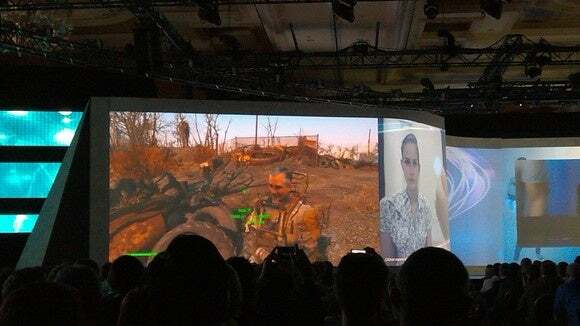 When complete, Krzanich appeared as a character in the recent game, Fallout 4. Krzanich was successfully scanned into the hit game Fallout 4. Those little Curie chips mentioned earlier can do more than just fitness tracking. Krzanich invited composer A.R. Rahman on stage to play music via gestures, and announced a collaboration with recording artist Lady Gaga and her Haus of Gaga studio to “showcase technology through creativity at the highest level.” (Stealing a page out of Panasonic’s book, Intel?) Additionally, Intel and House of Gaga will team up with several online media companies in a fight against online harassment. Because we can never get enough drone demos, we saw an impressive display from the Yuneec Typhoon H drone, which incorporates Intel’s RealSense Technology for identifying its surroundings, making it “the most advanced collision avoidance system of any drone,” Krzanich said. The remote even allows the user to see what the drone sees. Krzanich showed off the drone’s capabilities on a simulated test track live at the keynote; he also featured a prerecorded video shot in Mexico. The Typhoon H will ship this year for less than $2,000, Krzanich said. The Typhoon H chases a rider down a test track. Another highlight was the latest augmented reality helmet from DAQRI, presented on stage by DAQRI’s founder and CEO Brian Mullins. The company built an Intel Core M processor inside of a hard hat—yes, a hard hat—and paired it with a camera. The smart helmet uses augmented reality, so a plumber, for example, could use it to identify parts and order replacements, and can even use thermal vision to detect hidden problems. This hard hat is available today through DAQRI’s partners. An unexpected surprise was the Ninebot Segway, an Intel Atom-powered Segway that uses a built-in RealSense camera to follow the user around. When you’re not riding it, the Ninebot collapses into a personal robot that you can control via voice commands and interact with in different ways. (It even has arms!) 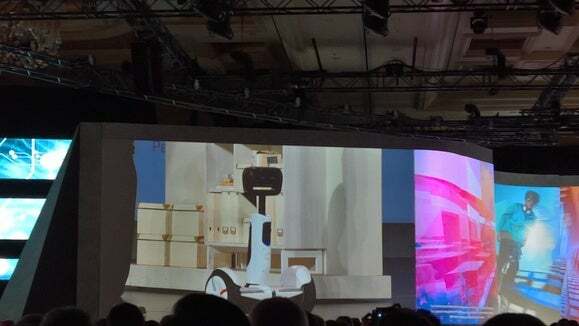 “Developers can begin creating for the Segway robot, which will come available in the second half of 2016,” Krzanich said, adding that this will become an open platform connecting developers and robots. The ninebot Segway transforms into a personal robot. Krzanich also said that the company had met its goal of making its Intel products all conflict free by 2016. 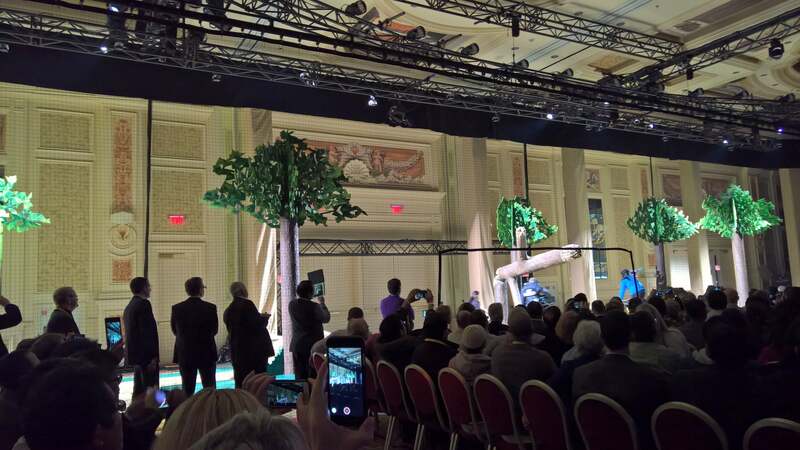 How’s that for a CES kickoff?